A blog about jazz pianist Herbie Hancock with sporadic posts that lie somewhere between scholarly and "dude!" Welcome to the blog post about one of Herbie’s most swinging tunes. “Drifitin'" is the sixth track on his 1962 album Takin’ Off. This was Herbie’s first record as a leader. The album also features Dexter Gordon on tenor saxophone, Freddie Hubbard on trumpet/flugelhorn, Butch Warren on bass, and Billy Higgins on drums. The album contains all original Herbie tunes. 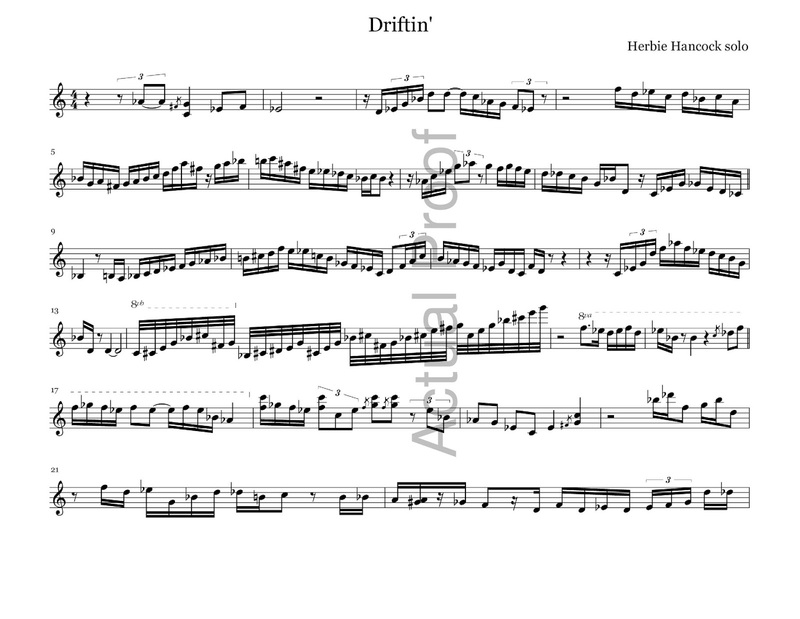 Compared to Herbie's later tunes, “Driftin’” is straightforward. The tune is in Eb Major, has a 32 measure AABA form, and contains functional harmony. 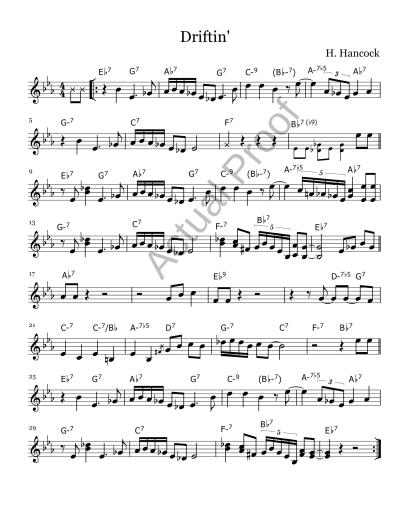 As the musicians play over this medium swing tune they use a variety of bebop and blues language in their improvisations. The group plays an arrangement of the tune that follows obvious patterns from jazz of this era. There are hits that punctuate the melody every four measures during the A sections. The horns play the melody for the first A section and Herbie plays the melody on the second A section. Then the horns return to play the melody for the B section and the final A section. They repeat this melody arrangement on the outhead and tag the last phrase three times to end. Dexter takes the first solo and plays one chorus. Freddie takes the second solo and plays one chorus as well. 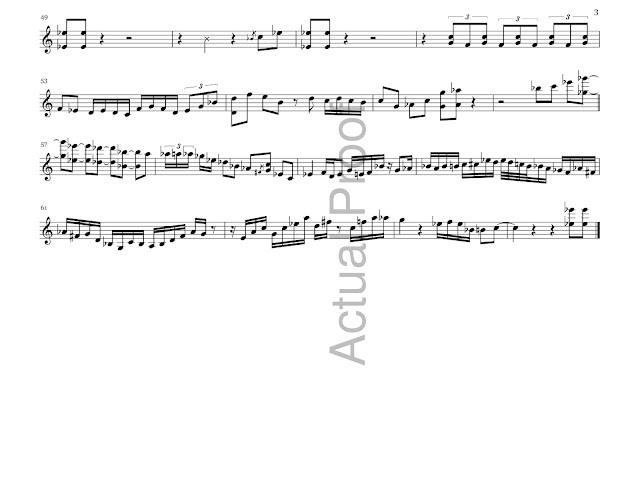 Freddie's solo contains many sustained notes and few rhythms faster than eighth notes. Then Herbie takes the last solo. He begins with a short phrase that acknowledges Freddie's solo. However, by the fourth measure Herbie carefully tosses off sixteenth note runs. These fast runs comprise the majority of this chorus. Herbie executes a particularly fast phrase in this first chorus. 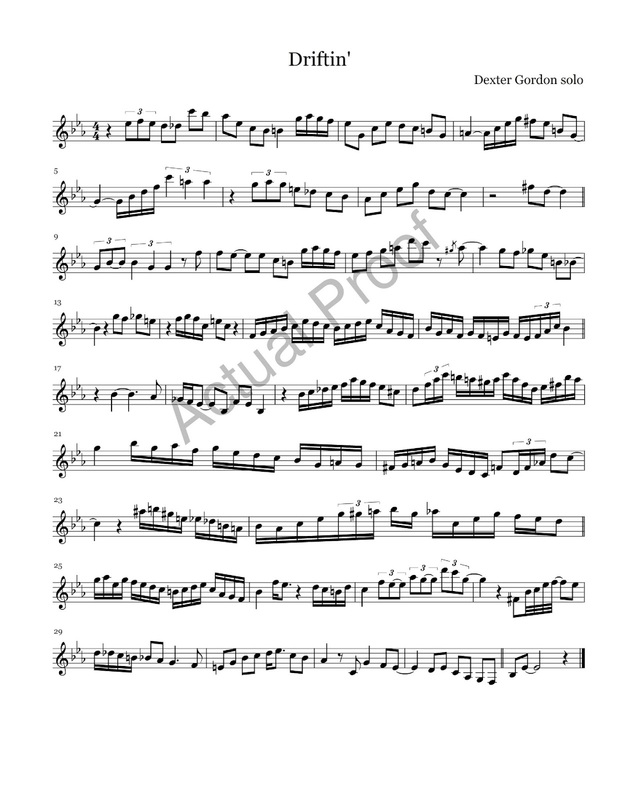 It occurs around 3:40 in the recording and over measure 14 of his solo (towards the end of the second A section and over a C7). 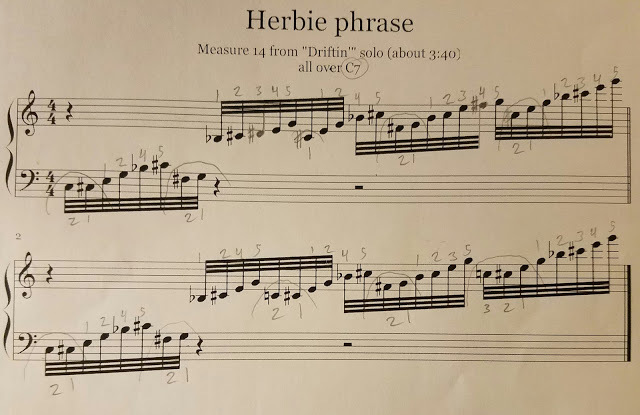 My transcription shows the phrase as 32nd notes but listening to the phrase in context reveals that Herbie meant it as a gesture. The phrase strikes a listener like a blur rather than a phrase that adheres to a strict rhythm. Lucky for you, this writer spent a great deal of time on this one phrase and includes all of the notes from this blur in the transcription. Herbie almost certainly used two hands to play it. The phrase starts below middle C on the piano in a range on the instrument where the left hand typically comps chords. (No left hand is audible at this point in the recording.) Further factors that suggest two hands include the speed, combination of white/black keys, and varying intervals. 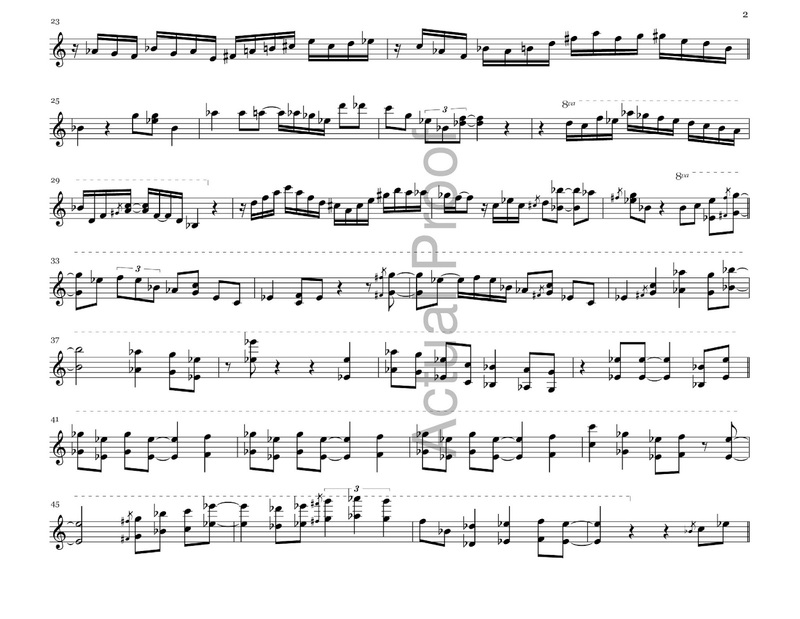 Going strictly off of what I transcribed, this is how I would play it at the piano. Numbers on the top would be for the right hand and numbers on the bottom would be for the left hand. Now, Herbie likes to play patterns, especially when he plays something complex. Allowing room for speculation, this writer sees an option for what Herbie meant to play. This guesswork relies on the assumption that Herbie plays patterns. It also depends on accepting that for piano technique, the intended phrase bears a striking similarity to the sounded phrase. That said, over this C7 chord Herbie probably thought two diminished seventh chords (C# and G) with a chromatic lower neighbor tone. More specifically, the chromatic lower neighbor of C# diminished seven in this context is the root of the C7 chord. Also, the chromatic lower neighbor of G diminished seven is F# which is a tritone away from C7. One important detail includes that G diminished seven and C# diminished seven remain the same chord, only with the four pitches ordered differently (G Bb C# E compared to C# Bb E G). This connection contributes to the phrase sounding like a blur. The entire pattern would repeat once. Below are both the sounded phrase (top) and intended phrase for comparison. Note that the spots for left versus right hands are quite similar. Also, the D# and F# in the top phrase could easily be accidentally played and in a similar way the added C's in the left hand in the lower example could easily be ghosted (half-played). Moving onto the second chorus, Herbie plays less fast runs. 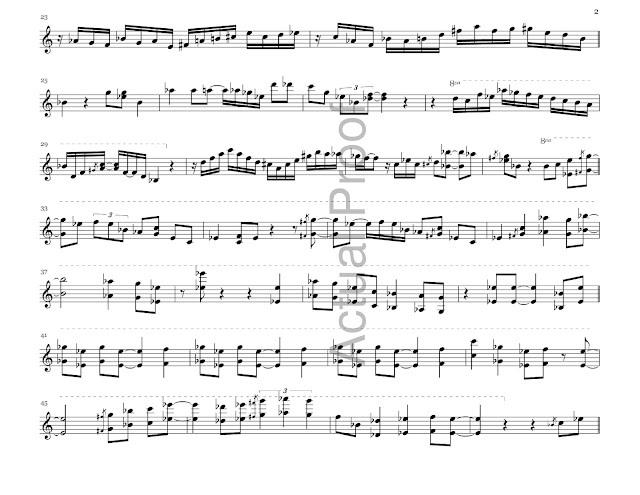 Instead, the second chorus contains a lot of locked hands playing and blues melodies. He frequently doubles the melody an octave lower with his right hand thumb. For nineteen measures in this second chorus Herbie simply plays the blues. Nevermind ii V's, nevermind diminished scales, and nevermind the changes. It's all Eb blues scale. During these blues and locked hands passages Herbie plays heavier and gets a louder sound at the instrument. 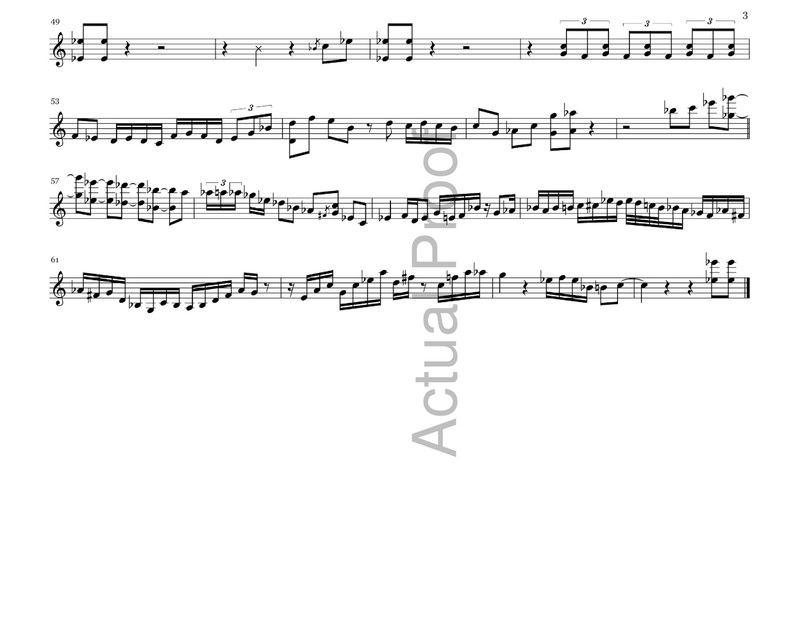 Combining the increased dynamic with the locked hands technique it achieves an effect similar to all of the instruments in a big band playing a shout chorus. During the bridge of Herbie's second chorus, Billy Higgins plays the cross-stick on the snare drum. He does it on beat 2 of measures 50-55. The first cross-stick "whack" comes during six beats of silence in Herbie's solo. Considering the sixteenth-note lines and locked hands that preceded, this blogger welcomes six beats of silence. Thankfully, Billy is there is to provide a hearty "whack" for Herbie." The moment happens around 4:53 in the youtube link. And yes, throughout the life of this blog I will eventually compile a list of the the "Top 5 times a drummer gave Herbie the cross-stick" and yes, this instance will be on that list. Herbie concludes his solo with more blues and more sixteenth-note lines. 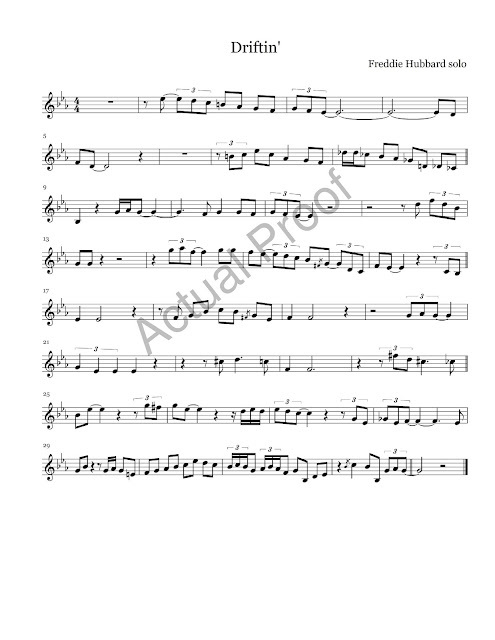 The full transcription of Herbie's two chorus solo follows. 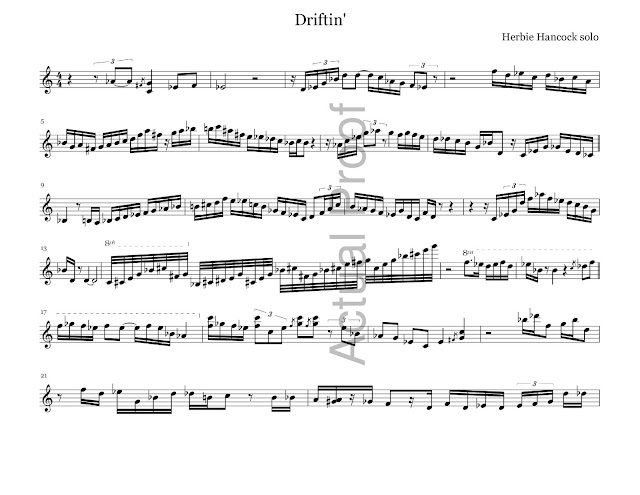 After Herbie's solo transcription, this blog contains transcriptions of Dexter and Freddie's solos as well. It seemed worthwhile to include them even though this is a blog about Herbie. Two quick notes about the horn solos. First, with all of the sustained notes, Freddie does not spell out the chord changes like Herbie and Dexter. Second, Dexter never plays the Bb-7 chord in the second half of measures 3, 11 and 27. This writer has seen charts that indicate that measure as C-7 or as C-7 then C-7/Bb. Herbie's right hand lines do not explicitly play Bb-7 there (except for m27 in the transcription). The Bb-7 in the above chart comes from Herbie's left hand. *Originally published under a pseudonym on April 4, 2016.